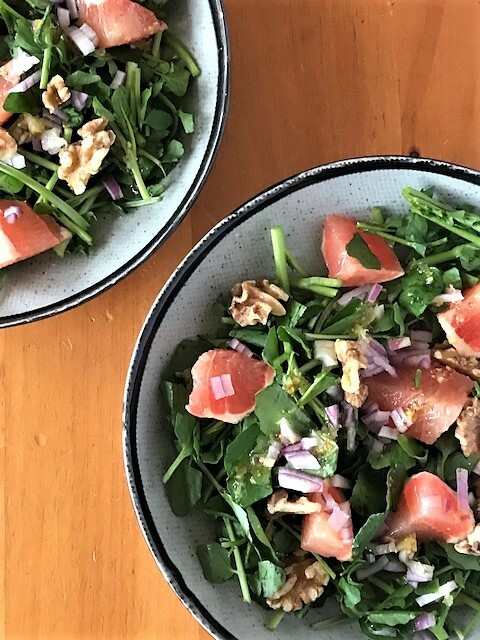 This watercress salad has a terrific blend of peppery greens, sweetness from the grapefruit and some zip coming from my secret ingredient in the salad dressing: marmalade. Place watercress in a clean sink of cold water. Swish well to make sure there isn’t any sand or dirt clinging to it. Place watercress in a salad spinner and spin or pat dry. Chop watercress into 2-inch (5 cm) pieces. Divide equally between two shallow soup bowls or plates. Whisk together the oil, vinegar, and Dijon in a small bowl or small measuring cup. Whisk in marmalade. Equally distribute grapefruit between the two plates. Sprinkle each plate with 1 tbsp (15 mL) red onion and 2 Tbsp walnuts. Drizzle equally with the salad dressing and serve. Mention watercress and most people will conjure up tea sandwiches. But this major player in the leafy green band is more than just sandwich filler. Recent research on watercress suggests that this leafy green I more than a sandwich filler. Antioxidant-rich watercress shows sports nutrition potential. In a study posted the British Journal of Nutrition, eight weeks of supplementation with watercress reduced markers of oxidative stress and damage after exhaustive exercise. Is it time to toss the kale smoothie and start adding watercress? I have. Chose bright green bundles that are free from any slimy leaves. Avoid any bundles that have any yellow leaves or are wilted or are more stem than leaves. Think perky. Once you get your little treasure home, eat it. Watercress doesn’t like living in your fridge so eat it ASAP. Sir Francis Bacon (1561-1626) British scientist, statesman, and philosopher claimed watercress could restore a youthful bloom to women. If that means no wrinkles, sign me up.